As patients move from one medical facility to another, their images often move with them. CDs largely have replaced films for sharing images between facilities. And though CDs offer a more durable and portable alternative to films, they also have caused some consternation. In addition to learning how to deal with images in various formats while making them available throughout the medical enterprise, one of the biggest concerns has been that digital images pose liability risks for facilities that load them into their PACS. Until a few years ago, many facilities chose not to load outside images into their PACS. Today, nearly all do. Michael Minear, chief information officer for the University of California (UC), Davis Health System, says expediting the patient encounter and improving the efficiency of physician workflow are two main drivers of this trend. 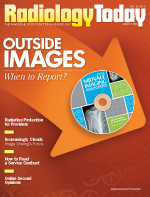 Using outside images also reduces the need for repeat imaging, which prevents unnecessary radiation exposure and saves money. So why have CDs been such a source of angst? “The problem was that CD-ROM broke radiology’s long-held workflow,” Minear says. CDs, in a nutshell, made the workflow from radiology to the rest of the medical enterprise not work. Many of the difficulties with proprietary image formats and workflow have been addressed, but the policies governing the reports associated with those images have not kept pace. Because reports also are sent in multiple formats and, in some cases, they may not be sent at all, they present their own set of problems. When to report on an outside image seems to be the main point of confusion for health care facilities in determining their liability risk. A few organizations have decided that they will issue their own report on any outside image that they put into their PACS. Although this method probably offers the most protection from potential liability, it is rarely adopted. Time-pressed radiologists don’t want or need an additional, significant drain on their time. And since the process doesn’t scale, facilities that accept a large number of referred patients or have large trauma centers face a disproportionate burden. While most health care organizations do not report on all of their prior images, there is some variation in how they store those images. Kaiser Permanente (KP) medical centers in northern California encompass dozens of hospitals and ambulatory medical centers. All outside images received by KP are given a medical record number and a nonbillable code, which then are loaded into the PACS as a nonreportable study, says R. L. “Skip” Kennedy, MSc, CIIP, technical director of imaging informatics for KP in northern California. Most of those studies have no prior report associated with them but, in some cases, particularly with mammography, the prior report is included as a secondary capture that has been scanned into the system. When there is a prior report, KP’s radiologists may mention it as it relates to subsequent imaging, but they don’t report on the original imaging. Although prior reports often are sent and received inconsistently, Kennedy believes it’s prudent for health care facilities to set up a defined process for acquiring prior reports. In serious trauma cases, for example, patients often are moved from community hospitals to trauma centers with images that are taken as soon as possible. When planning treatment and therapy, the physicians at the trauma center typically use the priors as a starting point until additional images can be obtained. The trauma physicians will report on the images they ordered, but the priors become part of the patient’s record, which could result in a legal gray area if the patient later files a lawsuit. Some organizations take a multistep approach to handling priors. UC Davis receives around 5,000 outside exams each month and handles 900,000 patient encounters each year in their ambulatory clinics. It is a teaching hospital with a busy trauma unit and emergency department. Outside images are loaded directly to a separate instance of its PACS reserved for outside images. The PACS is linked to UC Davis’ EHR so clinicians in any part of the medical enterprise can view the images from their regular workstations. If a physician feels that an outside image is significant for patient care, he or she can request that it be saved to the regular part of the PACS, and it will be assigned a UC Davis medical record number and added to the patient’s record. The exams in the outside imaging portion eventually will be deleted when the available storage fills up and space is needed for new exams, but Minear says that hasn’t happened yet. Even facilities that receive images on a smaller scale don’t see a need to read everything. Northern Westchester Hospital (NWH) in Mount Kisco, New York, receives around 15 outside studies, mostly mammograms, daily. CDs are sent to the file room, where they are loaded into NWH’s PACS as prior exams and can be viewed throughout the clinical enterprise. Still, in some cases, reporting on priors is inescapable. Leonard Berlin, MD, a professor of radiology at Rush University and the University of Illinois in Chicago and an expert on liability issues related to radiology, says if a referring physician requests that a radiologist render an opinion about a prior study, the radiologist should comply and issue a written report. Without a written record, the radiologist leaves open the possibility that a verbal opinion will be misunderstood or misconstrued, and verbal reports are considered the same as written reports from a legal standpoint. Berlin also advises every radiology group, in conjunction with its medical center, to formulate a written policy defining how outside radiologist studies are to be handled with regard to the PACS and the responsibilities, if any, of the staff radiologists regarding previous or new interpretations. “And, whatever that policy is, every radiologist in the department should follow it consistently,” he adds. Even as health care organizations come to terms with CDs, newer technology could force them to alter their approach to outside images even further. With the HITECH Act putting federal emphasis on data sharing, the motivation, as well as the ability, to exchange images among multiple health care providers is increasing. Health care providers will need to understand how to share images, not just across their enterprise but across multiple enterprises. KP in northern California is entering into an image exchange consortium with other health systems and hospitals, including UC Davis. Kennedy says HIEs such as this likely will become the prevailing model of health care data exchange over the next five years. However, the administrative and policy issues associated with HIEs present other types of liability issues: image security and privacy. Agreements such as the National eHealth Collaborative’s data use and reciprocal support agreement (DURSA) may provide a road map for how these types of exchanges are set up. DURSA builds on existing laws and describes the “responsibilities, obligations, and expectations” that its signatories agree to. Minear thinks DURSA would support most types of image exchange, but most HIEs don’t have the necessary expertise or infrastructure to support the exchange of medical images yet. The need for policies governing image exchange is becoming more urgent because the consumer demand for personal health data could further muddy the waters. Stage 2 of the meaningful use rules related to the HITECH Act, although they do not provide a lot of detail on medical images, mandate that patient portals be set up by October of this year, and that patients have access to their medical data through those portals. This change has been under way since personal health records (PHRs) linked to facilities’ EHRs began operating. With patients becoming more active and knowledgeable health care consumers, the demand for personal health data, including images, is growing. Minear says the next logical step is for patients to use their personal electronic devices to manage their personal health information. But most of the current technologies don’t yet support the access and use of digital clinical images, although, in most cases, patients are better served by the image report. The policies and procedures surrounding medical images will present a challenge in this realm as well.